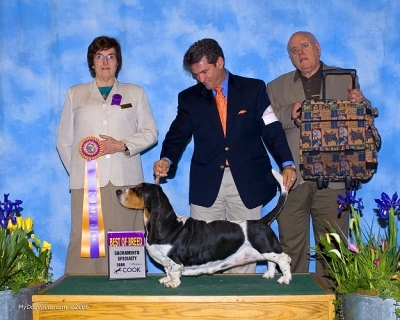 Blossom was bred by Becky and Red Pomeroy of Rebec Bassets, Salem, WI. She arrived in California in March of 2001. 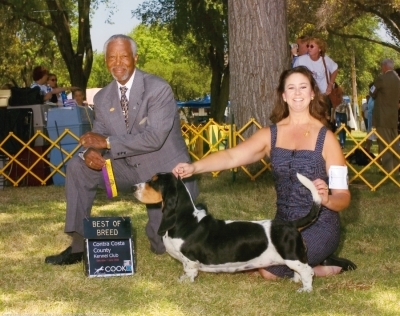 Blossom was both a wonderful show dog and a most loyal companion. She was an imp full of love, joy and happiness. I lost many pairs of sunglasses and shoes to Blossom, but she was so endearing that I could never get mad. 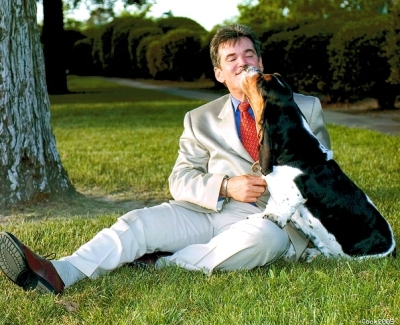 There was not a person or dog she did not love or want to know. She always made her presence known and was enthusiastic about the approach. She had such glee about everything. 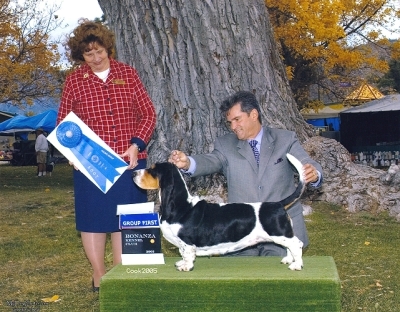 Blossom began her show career at 4 months by winning the puppy match in Hacienda, CA. 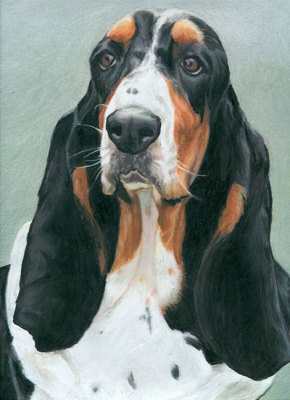 She was shown and finished by Heather Simonek. 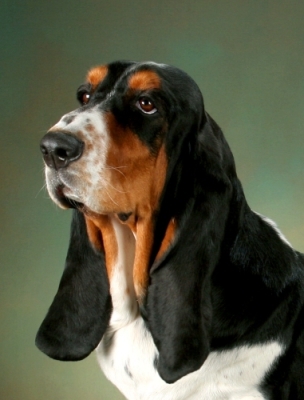 I realized that Blossom had the qualities to be a special. 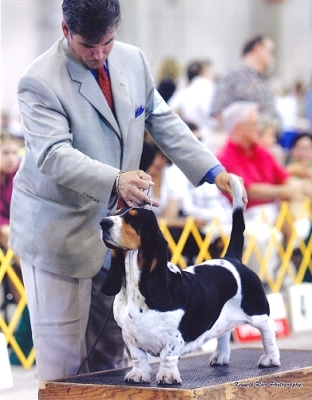 Mike Stone began specialing Blossom in 2004 and continued with her until her retirement in 2007. 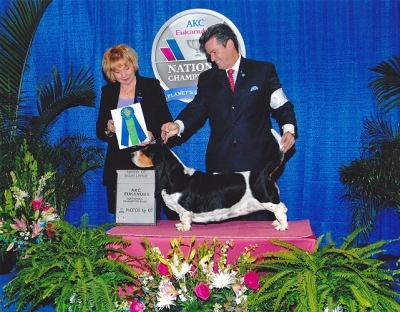 Blossom was well known for her exuberance in and out of the show ring and in everyday life. 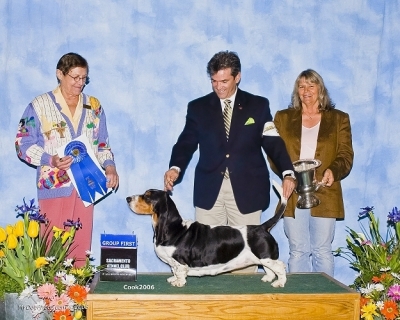 She loved the show ring and thought it was heaven to be in amongst the other dogs. 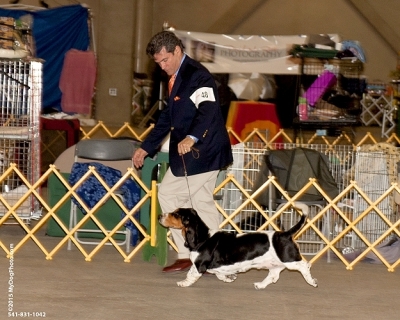 At one show, she ran to the cut line before the judge pointed to her. Judge laughingly said, “I was going to point anyway”. 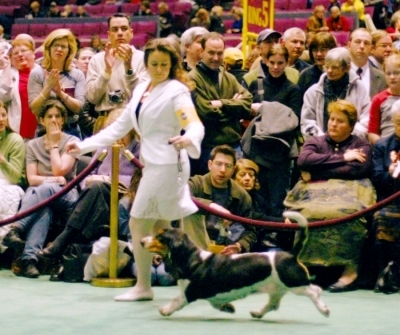 The crowd would share her enthusiasm in the group ring and cheer her on. One time the crowd was so loud at an indoor show that the floor began to shake. The shaking floor and crowd gave her a group one. 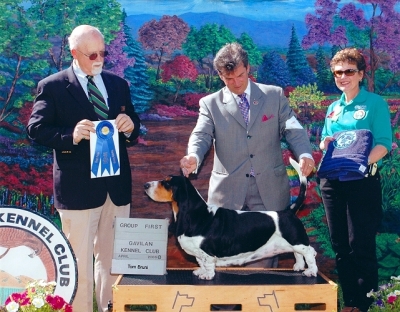 Blossom was bred in 2007 to CH. Topsfield-Cloverhil Buggybumpers and had 5 wonderful puppies. All 5 became champions in a short time and she stood by the ring urging them on. 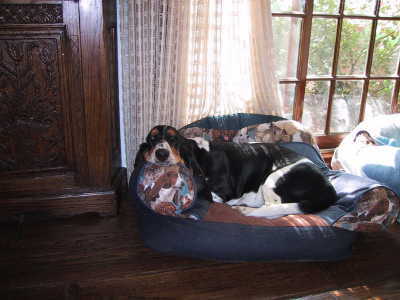 She loved and played with her five puppies all day long until her passing in 2010. 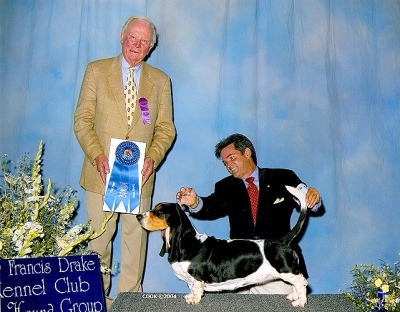 It was quite a memorial to Blossom that her daughter Violet won Best of Breed at the BHCA Nationals that year. 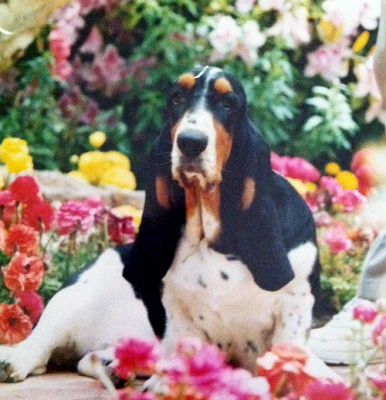 There is not a day that goes by that I do not miss Blossom and her companionship. She will be in my heart forever and she left me an amazing legacy in her son, daughters and her grandchildren.